Quite honestly, Two Acres has been on an incredible run. In the early years, it seemed as if I always preferred the even years – 1998, 2000, 2002, and so on. 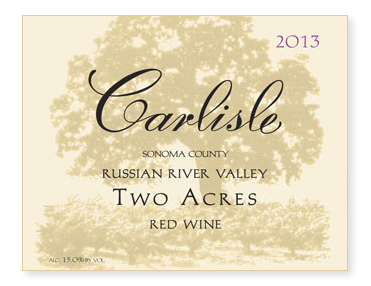 But from 2007 on, the wines from these two acres of vines planted in 1910 have been absolutely lip-smacking delicious. The Petite, Peloursin, and Syrah were picked on October 4th and co-fermented as one lot while the Mourvèdre, Carignane, and Alicante were picked a week later and co-fermented in another lot. Usually a kitchen-sink blend of both lots is our favorite but in this vintage we preferred a blend that left out several barrels of the Mourvèdre lot. Indigenous fermentation on both lots. Only 15% new oak. Bottled unfined an unfiltered.